Ready to feel the freedom of the sun on your skin, the wind in your hair, and the ocean all around you? Skimboards let you literally skim over the surface of the water, whether you’re inland or out in deeper water. Of course, not all skimboards are alike, and you’ll need to make an informed decision. Let’s take an immediate look at the best skimboards for 2019. 8 How Does a Skimboard Differ from a Surfboard? 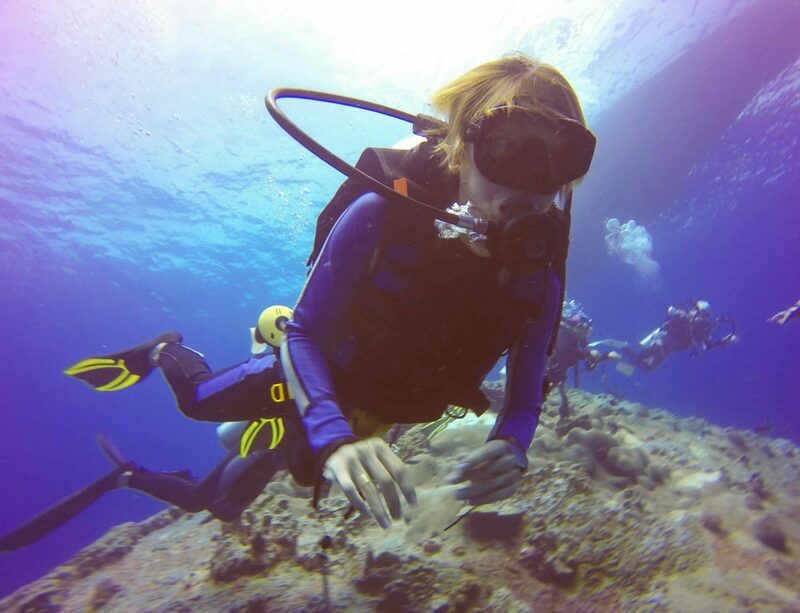 Ready to jump right in? Below, you’ll find a convenient comparison chart, but we’ll delve into each board in greater detail after that. Now that we’ve given you a brief overview of our selections for the best skimboards of 2019, it’s time to dig a bit deeper and see what each of these boards truly offers. The Avac by Apex is designed to provide professional-quality performance, and comes bundled with a book of tricks. The board is sized to fit kids or adults, and features carbon fiber and fiberglass construction for the lightest weight possible, combined with the stability needed for performance and reliability. The board also offers a high-gloss protective coating to ensure better durability, as well as to provide the best skimming surface. Note that this board does come with traction pads – a three-piece set is shipped in a separate box, and must be installed to match the rider’s preferences. 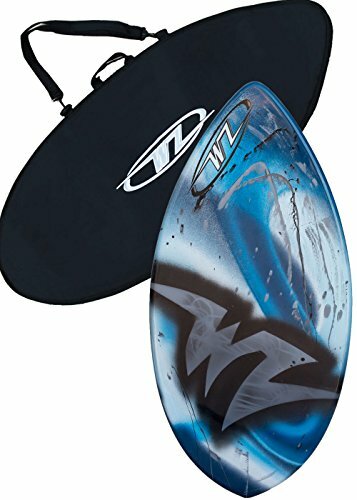 It’s also important to note that while this skimboard can be used near the shore, it is primarily designed for wave riding in deeper water. The Lucky Bums wood skimboard is available in a number of sizes to fit different riders. 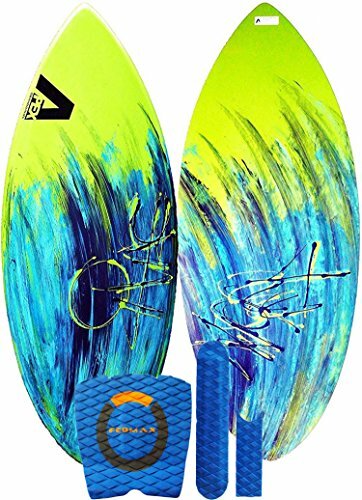 It is usable by beginners and intermediate skimboarders, and the company features a range of different print options to suit individual tastes. Note that this board has a very minimal rocker, and the board’s body is mostly flat. This makes it an ideal option for inland riding, and it is not well suited to wave riding. 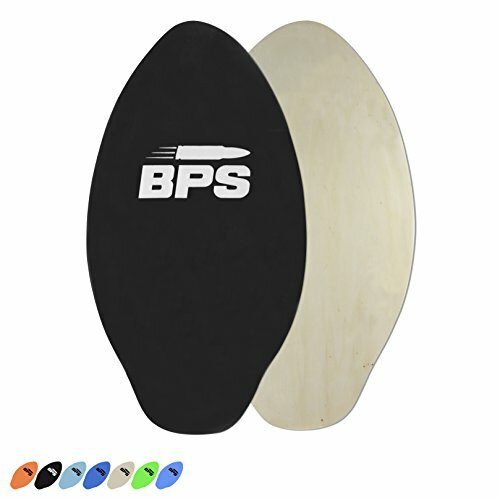 Those interested in purchasing this skimboard should be aware that it does not come with grip pads. While the finish does offer some grip for your feet, you may need to buy a set of pads and install them on your own. Note that this board does come with a 100% satisfaction guarantee from the manufacturer, though. This skimboard is designed for use in shallow water. The BPS Gator is a wood skimboard, but one with a difference. Rather than the traditional leaf or teardrop shape, you’ll find that the rear shoulders of the board are slightly inset, with a bulged rear. This is designed to provide better traction and offer an anchor point for your back foot while riding. The board is available in a wide range of colors, as well as several different lengths to suit your size. Along with the board, customers receive an emailed use/riding guide, and the board also comes with a 12-month satisfaction guarantee. Note that there is a built-in grip layer on top of the board. While the skimboard itself is made from wood, the grip layer is made from high-quality foam. Note that this board is designed for inland use. 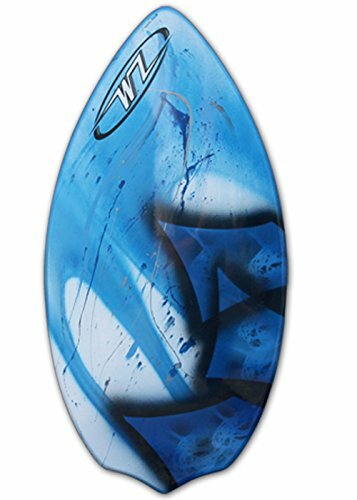 The Wave Zone Edge is a higher performance skimboard designed primarily for intermediate riders. It features a lightweight fiberglass body with a foam core, along with a gel coat for durability and grip. The board is available in only one size, and has a maximum weight limit of 130 lbs. so this is geared for smaller adults, as well as teens and children. Note that this board comes with several purchase options. You can opt for just the board if you like, but it can also be purchased with a bag, with a pad set, or as a three-piece set. 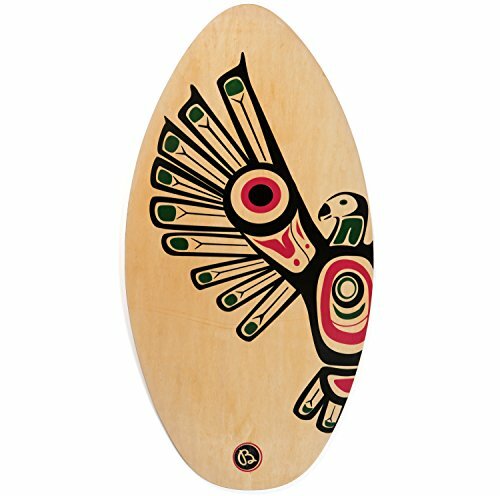 Note that this skimboard is handcrafted in the United States, and ships with wax to care for the board, as well as stickers and a hand signed note from the company’s owner. Note that the Edge is a hybrid board equally at home riding waves or skimming the sand in shallow water. Made by the same company as the Edge above, the Wave Zone Diamond is designed for beginners, rather than intermediate riders. It features the same fiberglass body and foam core as the Edge, as well as a gel coat for durability, protection and grip. Riders will also find the rear of the board is a different shape to accommodate footing for beginning riders. This board’s weight limit is 110 pounds, so it is definitely designed for small adults, teens or children. It is only available in a single length (38 inches). Like it’s more advanced sibling, the Diamond is handcrafted in the United States, but it does not ship with wax or stickers. Note that this board does not include grip pads of any type, and it may be necessary to purchase a set from another manufacturer to ensure stability while learning to ride. Note that this is also a hybrid board, and works for both waves and inland riding. 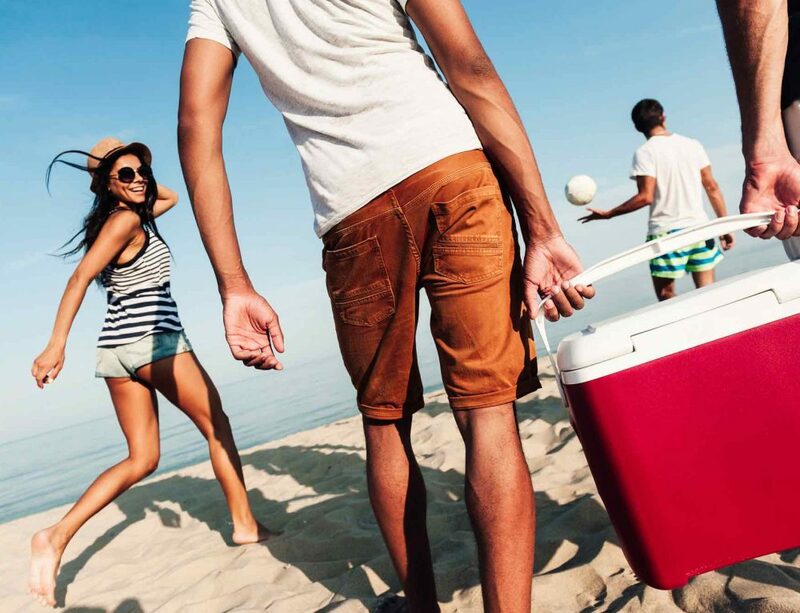 Heading to the beach this year? In addition to soaking up the sun, you’ll want to spend some time in the waves. Of course, there’s only so much fun to be had actually swimming in the water, and you might not be in the right area for full-blown surfing. Skimboarding is a great option that allows you to have all the fun of surfing without the need for major waves (or experience as a surfer). With that being said, you’ll need to know a thing or two about skimboarding, and you’ll need to have the right skimboard, too. Whether you’re completely new to the sport, or you know what it’s all about and are just interested in buying the best skimboard, this guide is for you. If you’re new to the sport, you might be wondering exactly what skimboarding is. Really, it’s a sort of fusion between surfing and skateboarding. Skimboarders perform in the shallow water near shore, and don’t need large waves to enjoy their pastime. However, they do need at least a little room to get a running start, and they also need good balance and coordination. The same abilities and aptitudes that make for a good skateboarder will be important with skimboarding. In a nutshell, a skimboarder stands just ahead of the incoming surf line, and gets a running start. Once up to speed, you’ll toss the skimboard into the water ahead of you, making sure it skips a little on the surface. Next, you’ll jump from the sand onto the top of the board, maintaining your forward momentum. The board’s wide, flat surface combined with your forward movement will allow you to skim over the surface moving down the beach parallel to the water. Sound tricky? It can be. If you’ve never skimboarded before, you’ll need to practice. The most important part is to make sure that you hit the board with both feet, while still moving forward. Hitting with just one foot will disrupt your motion, pushing part of the skimboard into contact with the sand. By landing with both feet on the board, roughly shoulder width apart, you keep a thin layer of water between the board and the sand, and your forward momentum does the rest. How Does a Skimboard Differ from a Surfboard? Skimboarding and surfing are related, although not that closely. Really, surfing is closer to snow skiing and skimboarding is more akin to skateboarding, at least in practice. 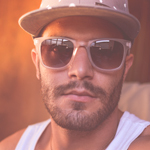 You’ll also find that surfboards and skimboards vary significantly in a number of important ways. While they are both used in the water, that’s about the only similarity they have. Skimboards and surfboards differ in many ways. Length: Surfboards are far longer than skimboards. However, skimboards can vary significantly in their length, depending on whether they are made for wave riding, or designed for flatland use. Weight: Surfboards weigh much more than skimboards, although some skimboard models can weigh quite a bit, particularly if you purchase a woody (a skimboard made from wood). Shape: You’ll find that surfboards and skimboards have very different shapes. Surfboards tend to be long and narrow, whereas skimboards usually have a roughly teardrop shape. Flexibility – Flexibility is all about how adaptable a particular skimboard is to your usage needs and personal sense of style. If you’re just starting out, you probably should focus on other areas first in order to develop your technique, and then worry about flexibility later. Weight – Weight is a significant consideration. We’re not talking just about the board’s weight, but about its ability to support your weight – it’s weight allowance. Wood generally has a higher weight limit, but also weighs more itself. It’s best to look for a board that can support your weight, but is neither too light nor too heavy. A lot of this will depend on how you intend to use the board, too. Speed – Speed is essential to skimboarding. 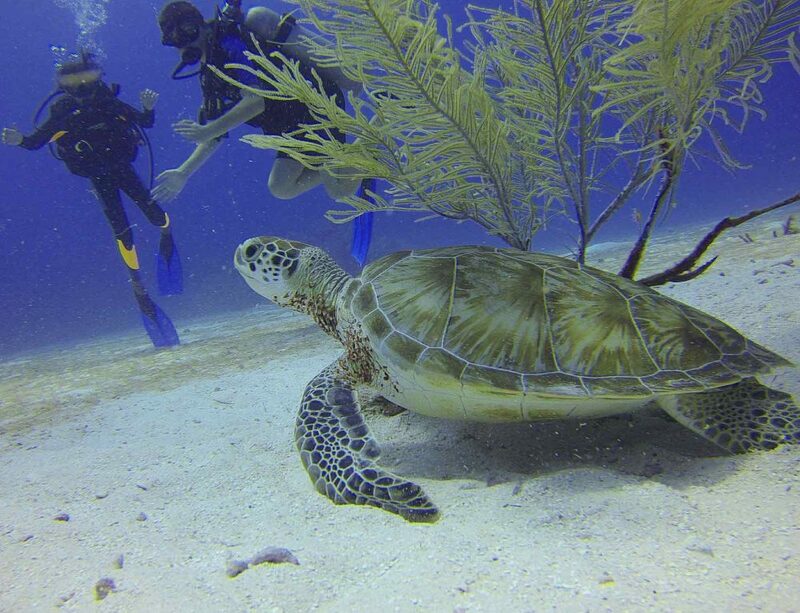 You need to move faster than the water in order to skim the surface. A board’s speed is due to a combination of its weight, your weight, the material the board is made from, the condition of the board’s bottom surface, and more. 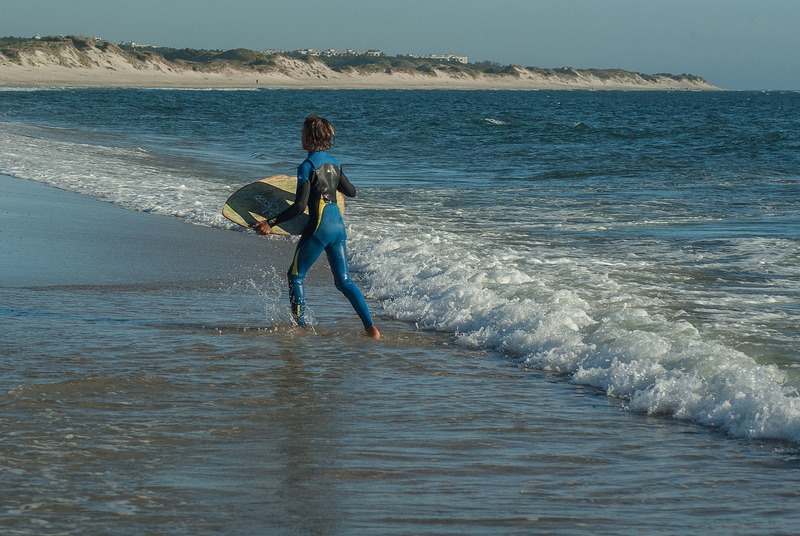 Wave or Inland – There are two main types of skimboard – those designed for wave riding, and those made for use on primarily flat, inland areas. Most wave riding boards are made from foam, while inland boards are made from wood. Material – Your primary choice when it comes to skimboards is wood versus foam. Both have their pros and cons. Wood is more durable, but is much heavier. Foam is lightweight, but may not last as long as a wood board. Cost is also tied to material. The more advanced the material, the higher the cost of the board. Rocker – “Rocker” is not really a feature of a skimboard, but is an ability delivered by the shape of the body. 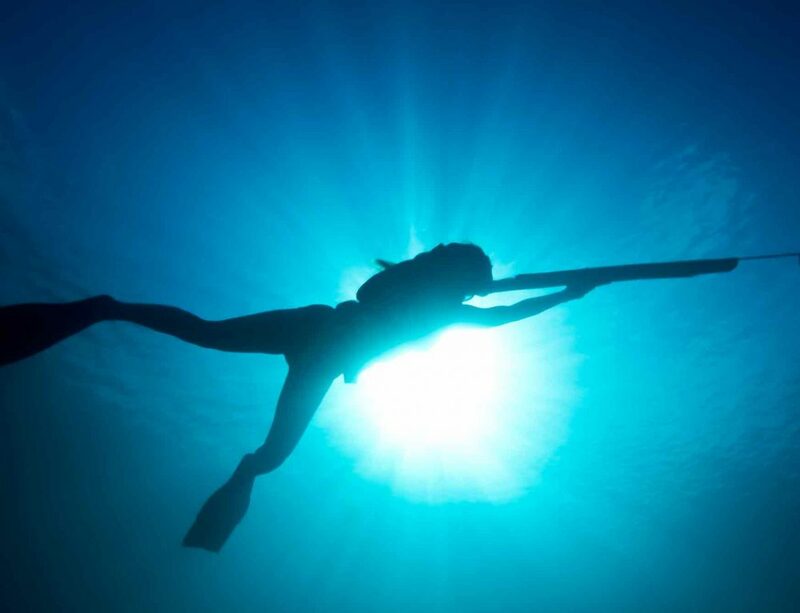 It’s the ability to raise the nose of the board to help keep it going forward over the water, rather than nosing down under the water and dipping. You’ll find three types of rocker on the market: constant, which is better for wave riding; hybrid, which works for both wave and inland riding; and traditional, which is better for inland riding. Match the board’s rocker to the type of riding you intend to do. Size and Shape – While skimboards do not vary all that much in terms of size and shape, there is some variation out there. The larger a board is, the heavier and more difficult to maneuver it will be. However, larger boards also offer a bit more stability for those just starting out. There are many variations on shape, as well. For beginners, the traditional teardrop shape is recommended, particularly if you’ll be riding the shoreline. If you’ll be riding bigger waves, you might want to consider a different shape, though, as the rear shoulders of the board will affect your riding experience. 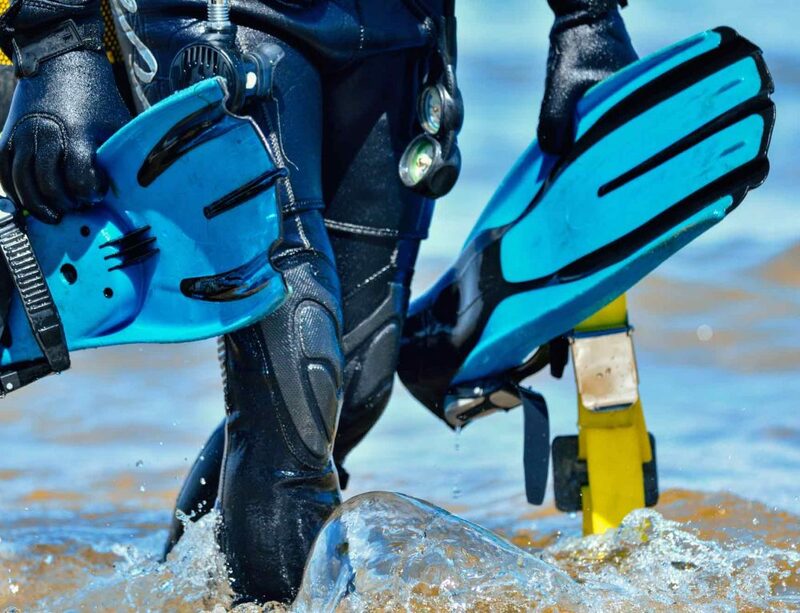 Traction – Skimboards can be quite slippery, and they often do not come with any sort of traction aid. You can purchase traction pads on your own and add them to the surface of the board. Make sure you get some time in on the water beforehand, so you know where the pads will be best positioned for your personal riding needs and style. Our list of the best skimboards for 2019 includes something for everyone. There are boards for beginners and intermediate riders, those who want to take on waves and those who prefer riding inland, those who want a unique stylistic design, those who prefer the stability of wood, or the lightness of foam and fiberglass, and more.